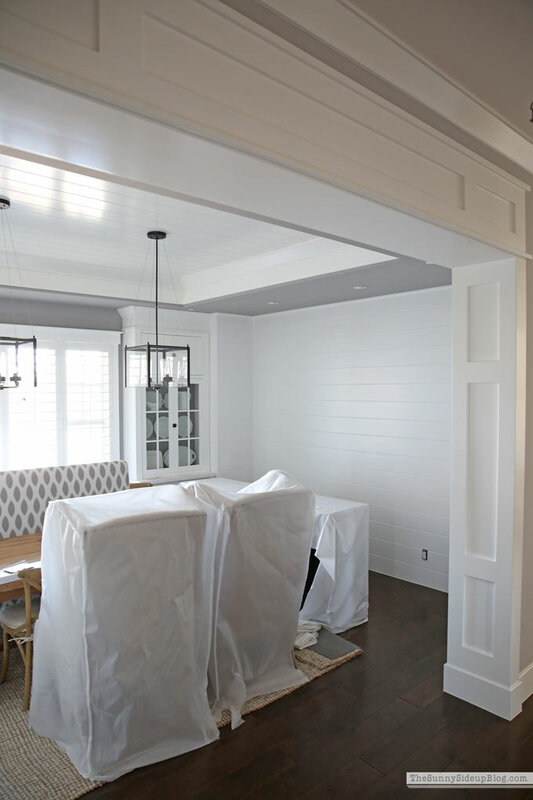 Popping in quickly today with an update on my dining room shiplap walls! Quick recap for anyone tuning in for the first time! I mentioned in a previous post that even though I loved the gray paint on these walls, the lighting in the front of our house where this dining room sits isn’t great and this room always looked and felt so dark to me. Here’s how it looks now after some fresh white paint! I don’t have any progress pics of the paint going up because we were in the hospital with Kole when our painters came. I told my painter the night before that I’d leave a door unlocked for him while I was picking up kids from school and be home soon after he got there. He called me that day at around 5:00 to see if I was coming and I was like “oh my word! Totally forgot about paint! We are in the ER. Just make it look good!” Sometimes your day just take a minor detour! You can see in this pic that our dining room is to the side of our front entry. I’m going to do some walk throughs of parts of our house on IG stories as soon as I get it all decorated for Christmas! I get a lot of questions about our floorplan so I’m hoping that will give some of you an idea of how our house is laid out. So my bestie Chuck was back at our house again this afternoon! This is an awful iPhone pic I snapped quick but I wanted to share the progress real time. I was so excited to see these mirror frames go up today! I’ve had my eye on them for a while. I knew I wanted some sort of a mirror on this wall (again trying to add brightness to this space) and out of lots of options I finally decided on these Aiden Large Wall Mirrors. I kind of laughed because I looked at SO many mirrors from so many different stores (my cute friend Tritia even found some fun options for me!) and of course I ended up choosing the one option from PB. Not intentional! I just can’t help myself with that store. Admitting my problem is the first step right? Talk about a transformation having mirrors on this wall! I’m so excited about them! This mirror actually comes in a panel of six so I bought three of them and had Chuck hang them together. The mirrors are still filthy so better pics of this room decked for the holidays will be coming soon! But I was too excited to show you all the progress to wait. :) I’m keeping everything neutral for now so that I can add Christmas red and green, but after the holidays I’ll bring in some color. I’m getting my table ready for guests (hosting a Christmas pajama party this month!) 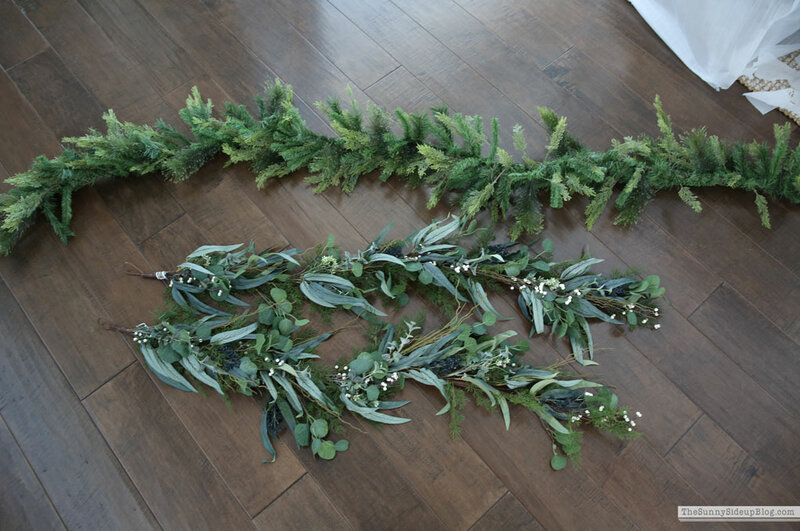 and I’m going to use this beautiful Euculyptus Berry and Pine Garland I shared earlier for the table. Here’s a pic of this space last year around this time. Off to a good start but definitely not complete! I recently took down all of our pumpkins. This stage is always so funny to me when my house is 50% Fall and 50% Christmas and 100% mess. 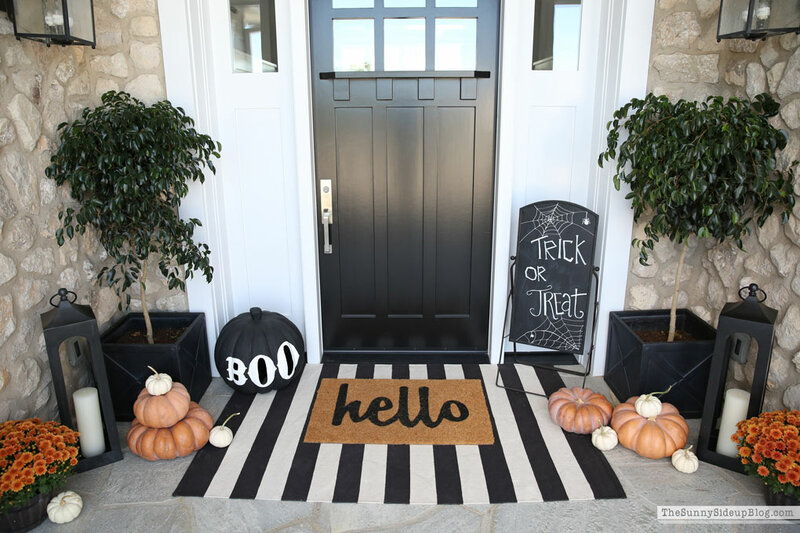 If you are like me and have a lot of pumpkins around your house that you hate to waste I’ve always loved taking them off the porch and mantel, etc. and using them as a tablescape. 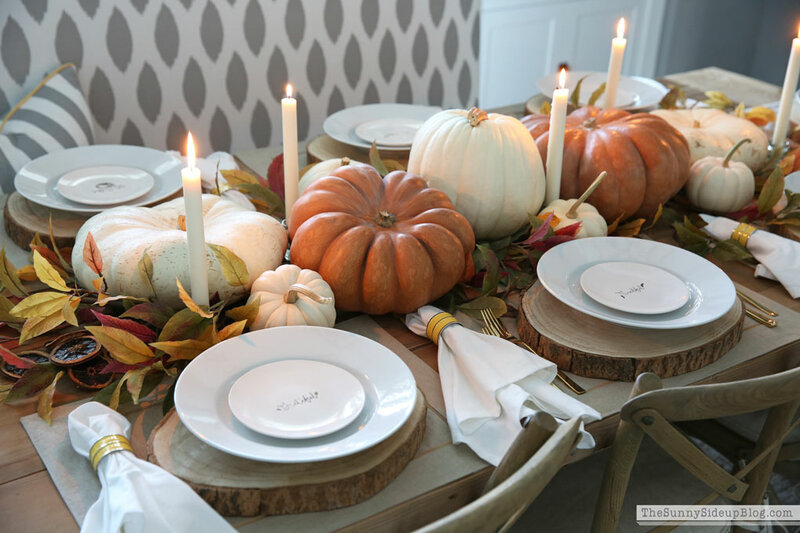 Toss them on your dining table with some leaves and candles and you are ready for Thanksgiving! 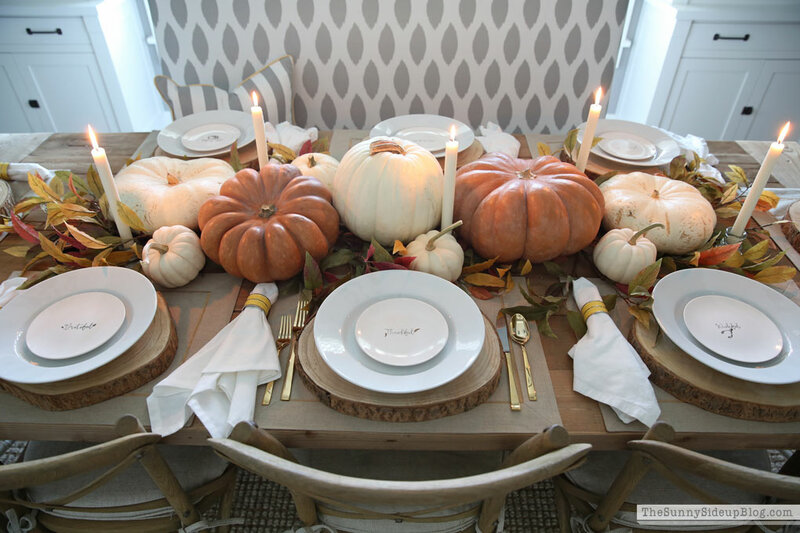 Or for just a Fall lunch/dinner with friends. Getting so excited for Thanksgiving! I love spending time at my moms with family and look forward to it for months. My mom and I wait to watch all the good Hallmark Christmas movies together while the guys are watching Football. My mom watches them all first in Oct/Nov and weeds out the cheesy ones and after some back and forth discussion on the phone she records the best picks for us. And I know. ALL Hallmark Christmas movies are cheesy. But some are a little less cheesy and more enjoyable than others and we have our favorites. I might need to make a spreadsheet to share with you all. We take our Hallmark Christmas movie watching marathon pretty seriously. It also reminded me that while I miss certain things about having little kids.. having older kids who entertain themselves early in the morning instead of waking mom up is pretty awesome. Almost as awesome as shiplap and new wall mirrors and Hallmark Christmas movies. That’s my favorite also Janine. I love the nosy neighbor and the end gets me every time. Please post a Hallmark Christmas movie list!!! My sister and I do the same thing with weeding movies out for each other! Love the walls! 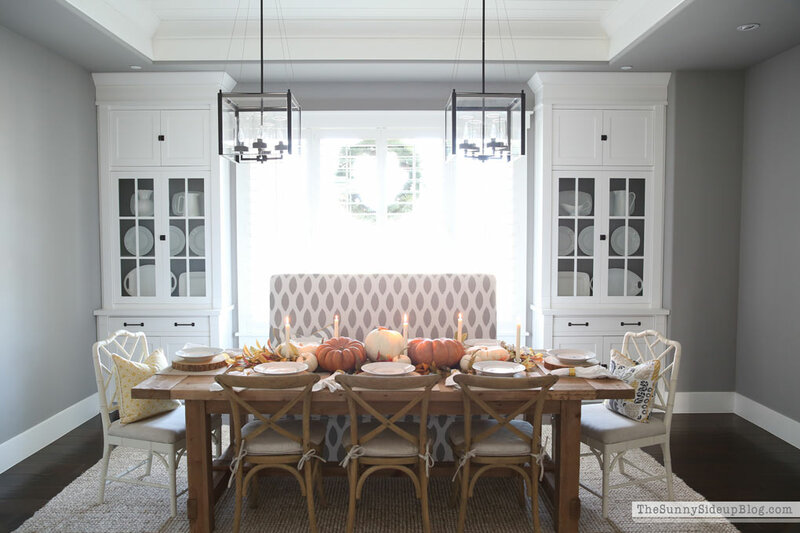 The dining room will be perfect for the holidays! Question about your built-ins…we have similar ones in our 1920’s house and I’ve always wanted to add lights in there but are your shelves glass so the light trickles down or are there multiple lights in the cabinet? Ours are wooden shelves so trying to figure out the best way to light them and hide the lights and wires! Thanks! 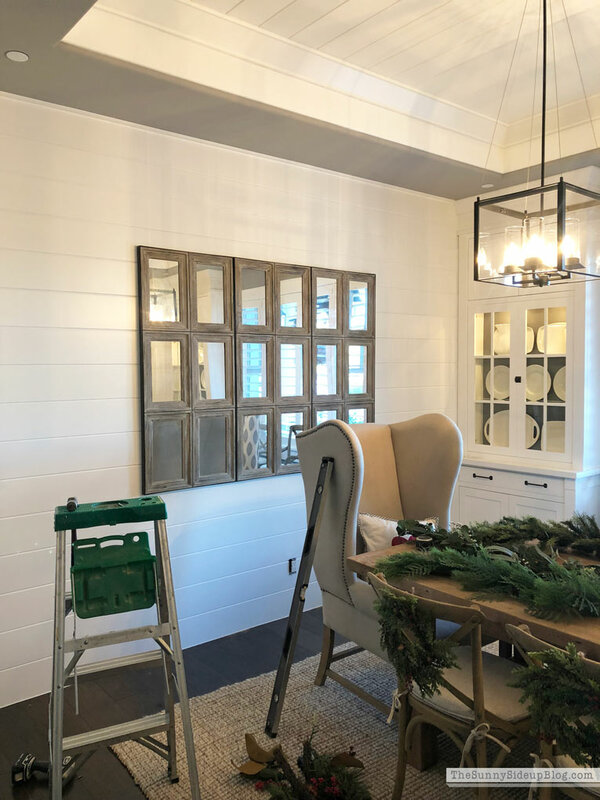 Your “new” dining room just looks SO festive Erin with all of the greenery and your new mirrors on the shiplap wall! Eeek! Love! Love it all. This room is looking fabulous. Oh my, that is such a precious pic of your little guy! 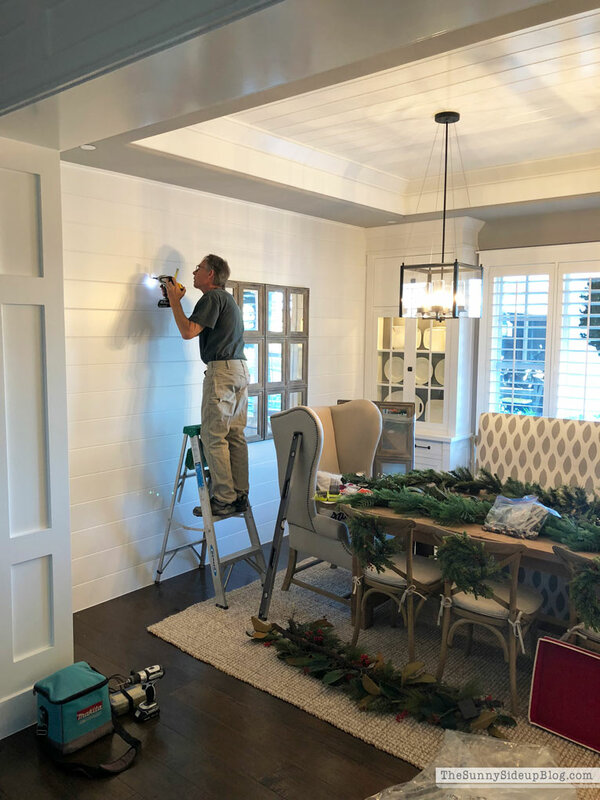 LOVE LOVE LOVE the shiplap….your dining room is looking amazing, and I cannot wait to see it in all it’s Christmas glory! He got out the Santa hat! 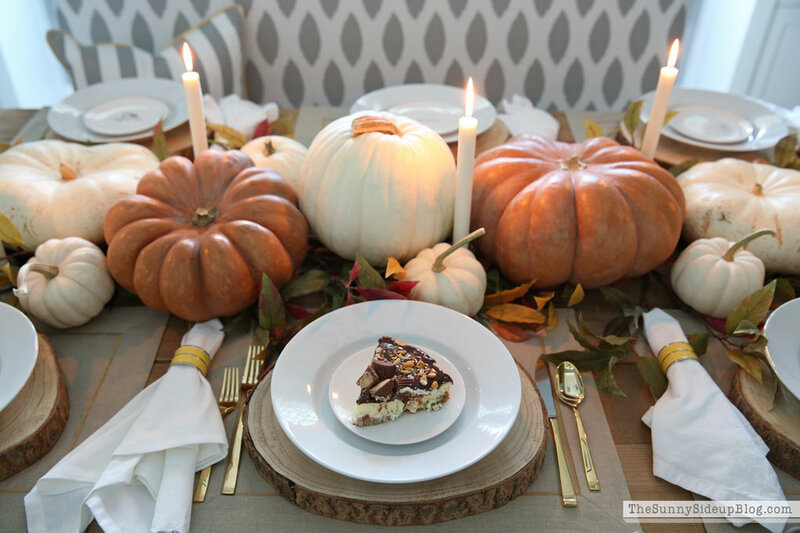 Let’s get dinner over Thanksgiving on the calendar! Text me and let me know how long you’re here for, we should be pretty open! Brilliant to leave the gray color in the tray area. Really defines it! And those mirrors…..I’m dying. 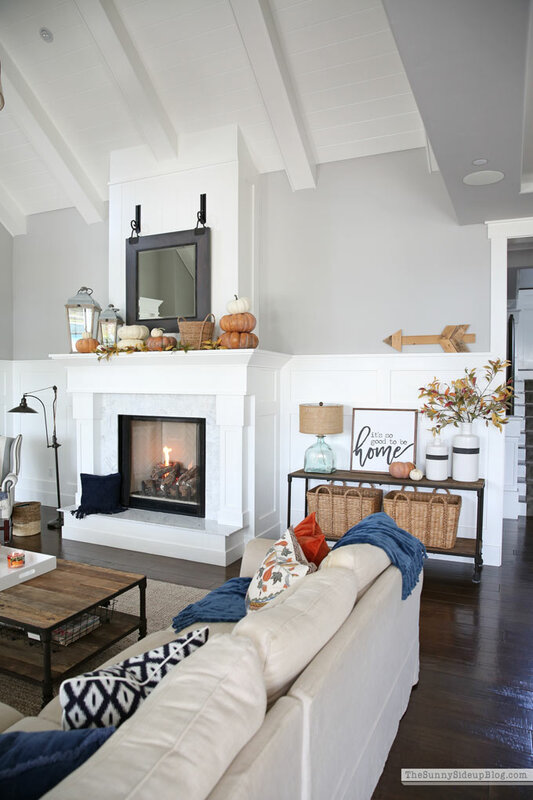 My entire house is gray and white with some shiplap so I love seeing what you’re doing in yours. Erin everything is coming together so nicely. 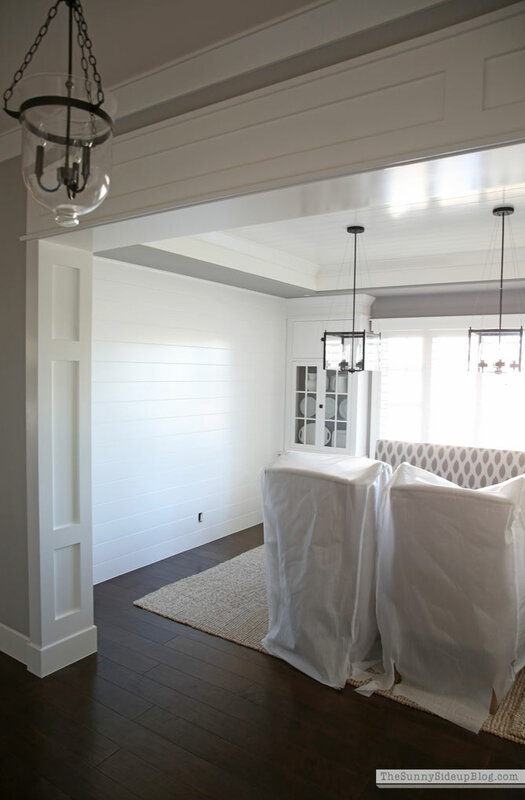 Just live what you have done with the shiplap to this room. How many times can I say “I want this”? 😆. Where did you get your charcoal chairs at the office table? Its looking so pretty Erin! I get the obsession with PB. Lol! I could live in that store. There products are great quality,unique and beautiful. 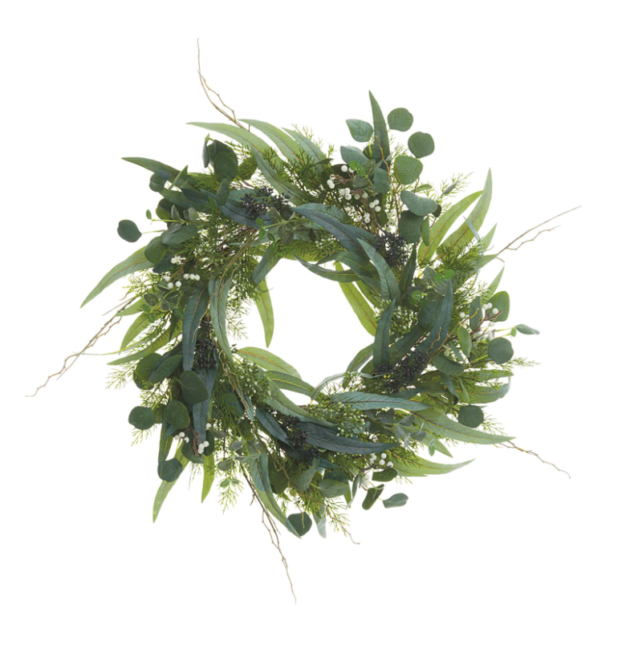 Its the first store/catalog/on line I browse when decorating any room! I love ALL their sister stores too. Love it all! 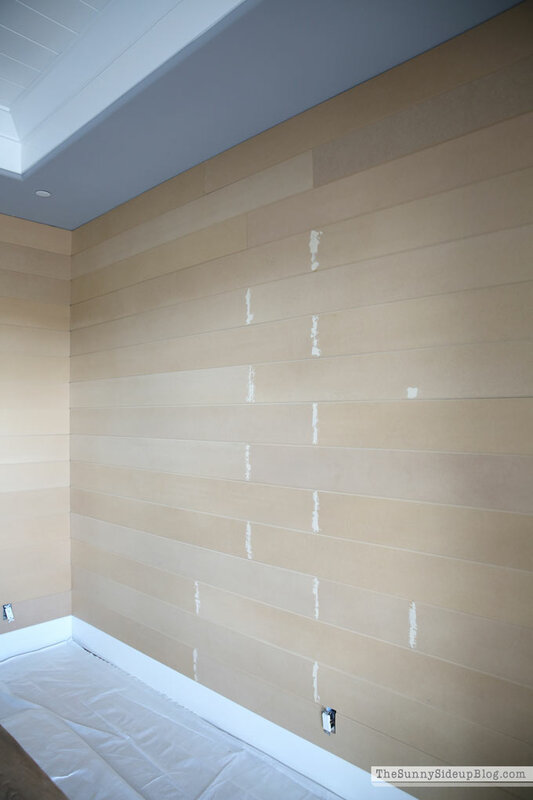 Could you please ask your carpenter the exact kind of material he uses to create the planked wall? 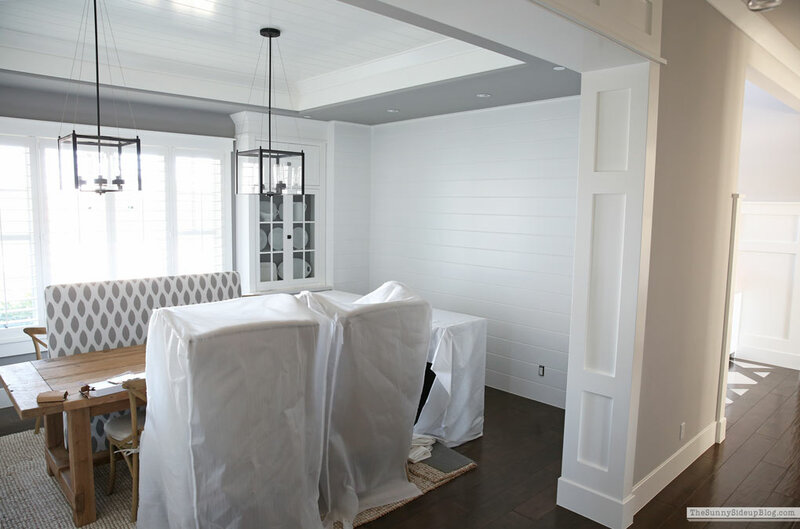 Wow, I love the addition of the shiplap!!!! 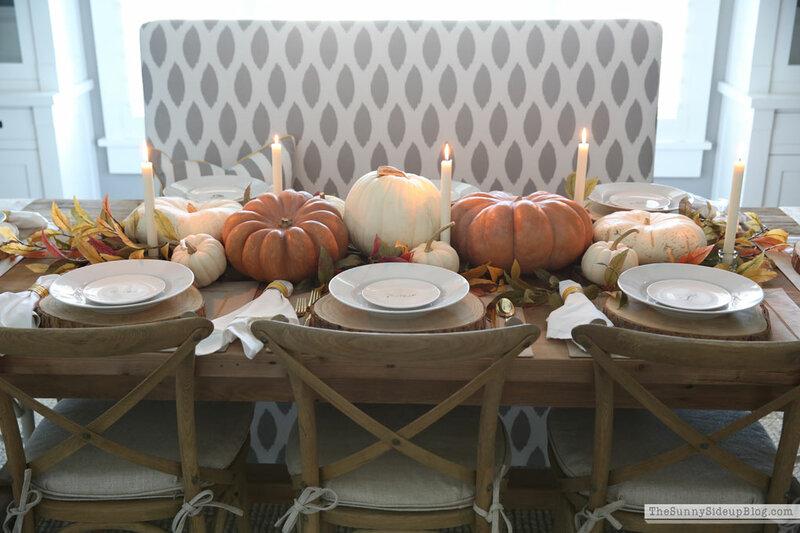 Your dining room was beautiful before, but now it’s stunning!!!! 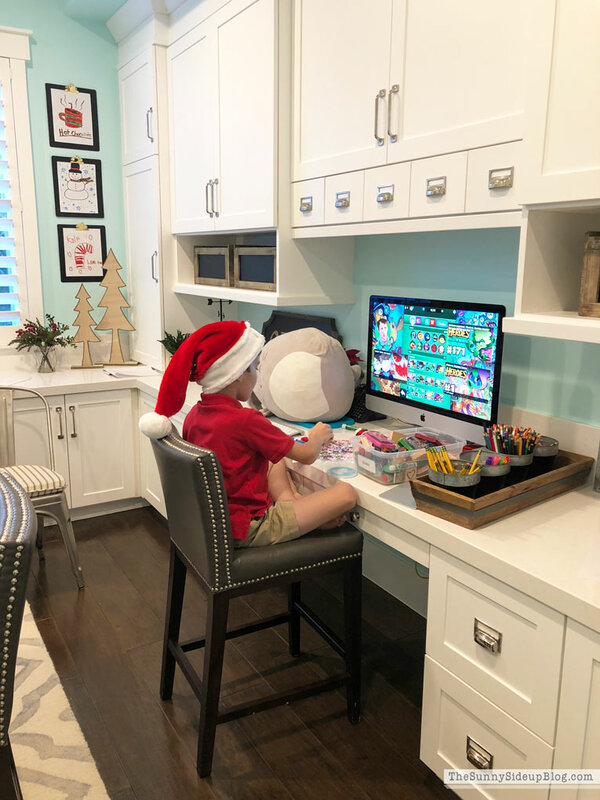 I can’t wait to see your dining room and the rest of your house decked out for Christmas. Your house is my design inspiration for our house. Would you share the details/specifics on the shiplap? I want to add it to our house somewhere, but I don’t even know where to look or what to look for. Hi Katie! Thank you so much! I’m thrilled you love it all! The shiplap is MDF and I went with 7 inches wide on these walls. I think my carpenter got it at Dixieline but I know you can get planks at places like Home Depot too! Let me know if you have any other questions! Hi Erin! I been following since you leave in your other house. I love your house!. I know for what you mention ed you live in San Diego Is it possible you could give me your carpenter phone number . I would love for him to do some work in my house. I live in Santa ana and maybe he could be interested or recommend me someone else. i will appreciate it. Hi Liz! Thank you for reading for so long! That means so much to me! Unfortunately my carpenter isn’t taking on any new jobs/clients. He had a bad accident last summer and is slowing down because of it. So sorry about that! I have looked through your website/blog and can’t find the source for your high back chairs at your dining table. xo your biggest Canadian fan!